Salmon with vegetables and baked potatoes is a quick and different way to make salmon, and you can take advantage of its properties without adding any extra calories. Fish lovers will always come up with the best recipes. For that reason, this delicious baked salmon with potatoes and vegetable recipe can add some pizzazz to your menu. Fish is one of the most eaten meats worldwide. When it comes to salmon, it’s the most recommended by nutrition experts due to its high content of fatty acids and protein that are essential for your body. Imagine all these benefits along with potatoes, tubers that are rich in vitamin B, which strengthens your nervous system. They contain magnesium, potassium, fatty acids and amino acids that can improve your brain functions. 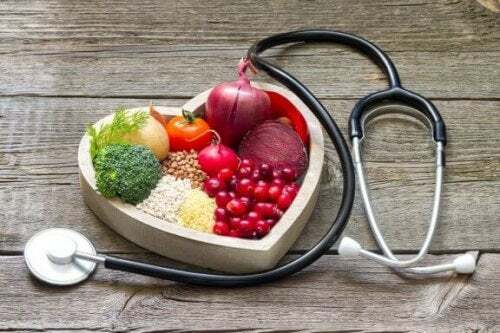 Plus, if you include the properties of vegetables, such as carrots (that are rich in vitamin A and ideal for improving your vision) or radish (that is very good for your liver and gallbladder), you will have the perfect combination of ingredients to make a very nutritious meal. 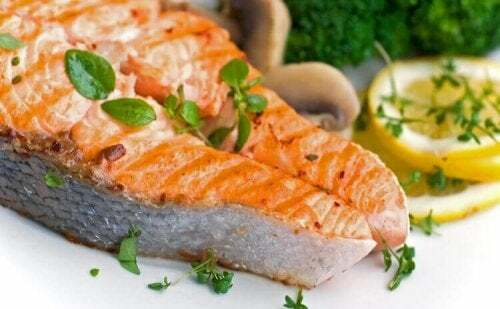 Give this delicious baked salmon recipe a try. Believe it or not, this meal can be much healthier than any other meal you have ever made before! Not only can you use carrots or radishes in this recipe, but you also can add other types of vegetables. For example, broccoli is rich in dietary fiber and proteins that prevent cardiovascular diseases and it can help you lose weight. Also, this meal is great for people that take care of their health and figure. 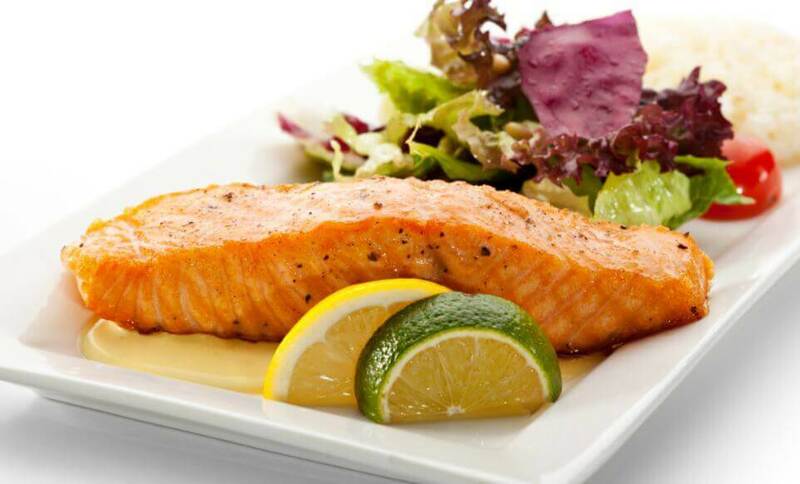 Therefore, this meal, is particularly low in calories and carbohydrates, because the salmon losses fat when it’s fried. Read this article, too: Can Eating Fish Reduce The Pain from Rheumatoid Arthritis? If you don’t know the trick of cooking meats such as fish, the trick is in their marinade. To do this trick, you’ll need to be patient in order to bathe the salmon with some wine, spices and let it sit in the fridge for at least 8 to 10 hours. That’s why it’s recommended to marinate the salmon overnight. 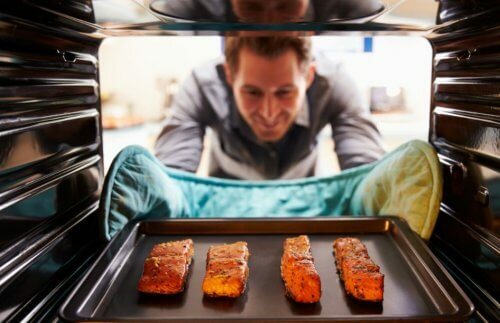 The first thing you need to do is to place the salmon fillets in a baking pan. Then, add all the spices along with the wine, garlic, and salt. Afterward, cover the pan with some food wrapping paper and let it stay in the fridge overnight. The flavor of the fish will be delicious due to its marinade. Once that time has passed, peel and cut the vegetables and potatoes in slices or chunks. Make sure that they’re not too thick. When the vegetables are ready, preheat the oven to 180 ºC (360 ºF). Then, take the tray with the salmon out of the fridge, pour the marinade into a seperate container and set it to the side, and then add the vegetables, leek, and oil. The marinade will brown the fish as it bakes. Cover the fish and tray will aluminum foil, and place them in the oven. You must uncover the foil to flip the fillets from time to time. After around 15 minutes, add the marinade and bake for another 15 minutes. 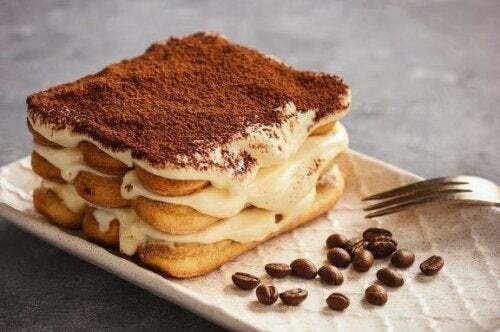 Finally, take the tray out of the oven, let it cool down a bit and serve with potatoes and vegetables. You can also add a little of the marinade for a better flavor. At this point, you can serve yourself a dish and enjoy your delicious baked salmon meal! Keep in mind that different wines are used when it comes to marinating meats. In the case of fish, white wine is best because red wine could give the fish a bitter flavor. You can change some of the spices in the recipe to make the fish more to your liking. There’s no problem in doing so, as long as you don’t overdo it. You don’t always have to use the vegetables in this recipe. If you want, you can change them to ones that you’ll like more. However, you should remember that this baked salmon recipe is not the same without them!